This is a really easy recipe to make. Be sure to use real butter (no substitutes). 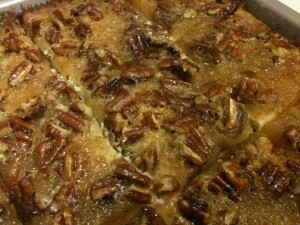 Debi Fasig (co-worker and contributor to Bartholomew Buffet) said that she likes my pecan pie bars better than hers!! That’s a HUGE compliment. As you know, Debi brings in some of the most delectable treats. Preheat oven to 350 degrees. Grease bottom and sides of 15 x 10 x 1 inch baking pan. In large bowl, combine flour, sugar and salt. With pastry blender, cut in 1 cup of butter until mixture resembles coarse crumbs. Press firmly and evenly into pan. Bake 20 minutes. In a large bowl, stir (by hand) eggs, corn syrup, sugar, melted butter and vanilla until blended. Stir in pecan pieces. Spread evenly over hot crust. Bake 25 minutes or until set. Cool slightly before cutting. Use a plastic knife to cut the bars and they won’t stick to the knife. Makes 48 servings.